The Five Second Journal by Mel Robbins. At the end of last year, I was considering my goals for 2019 when my wife invited me to join her for "Mindset Reset," a free program led by bestselling author and TEDx speaker Mel Robbins. I accepted the challenge, and at the start of the New Year and over the next 35 days, I got an email link to a video broadcast with Mel discussing a range of work and life topics. Mel offered tools and tips, including strategies for tackling anxiety and not pressing snooze when it's time for the gym. My favorite advice came when Mel shared her morning routine and provided a free journaling template from her popular daily planner, "The 5 Second Journal," which relates to our story on page 10, "Habits for a Great Tomorrow." For our story, we heard from Duke colleagues about their routines. Jen Ganley makes her bed in the morning. Brandi Tuttle sets her programmable coffee maker for 7 a.m. And Jill Adelson sets out gym clothes for the next day. "I'm not a morning person, but it's made it possible to take care of myself, be fully present at the job I love, and spend quality time with my family," Jill replied on our Facebook query about daily habits. One of my new morning habits is filling out the page Mel shared from her 5 Second Journal, which is available on Amazon. 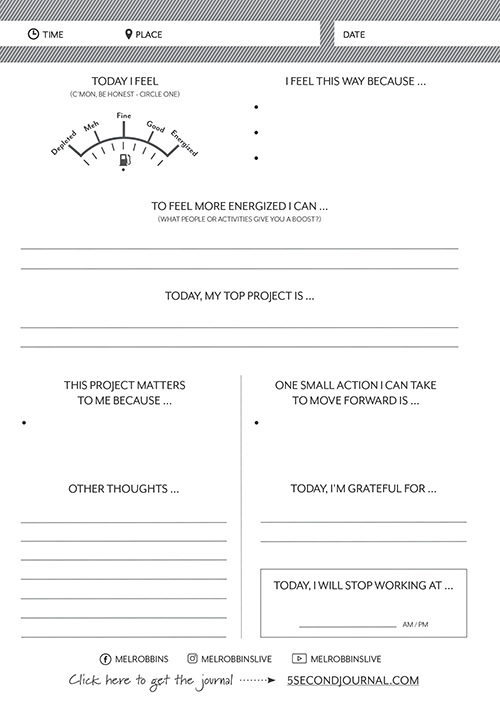 Dubbed "How to Have the Best Day Ever," her free template is here: bit.ly/DailyJournalTemplate. I journal around 5:15 a.m., after my alarm sounds for the gym. As I sip coffee, I scribble for 10 minutes, completing prompts such as "Today, My Top Project Is," "Today, I'm Grateful For," and "Today, I Will Stop Working At ..."
Mel's journal allows me to set priorities and focus on what matters for that day. Plus, one side of the page offers space for a "brain dump," where I jot a To-Do list. If you like Mel's template, download the PDF so you can make copies any time. I'd love to hear from you. Please send a note with your habits to Leanora.Minai@duke.edu.